Kelly Oubre Jr. played just six seconds in Game 7 as the Wizards lost to theBoston Celtics in the Eastern Conference Semifinals. And just like that, his season ended the same way it began; with one big question mark. Coming into the 2016-2017 campaign, the expectation was that Oubre would step into the backup role left vacant as the Wizards opted not to re-sign guys likeGarrett Temple and Jared Dudley. The hope was that the second-year player would slowly morph into a 3 & D player that the Wizards have sought out sinceTrevor Ariza’s departure. And although Oubre did improve from his rookie season, he still has a ways to go. Even though Oubre struggled to score at times, Scott Brooks often opted to play him over Markieff Morris with the starters to close out games during stretches in December and January. However, when he spent time playing alongside the second unit, he struggled to score. Although Oubre’s minutes essentially doubled from last season to this season (10.7 to 20.3), his scoring never came around. The second-year player worked with Drew Hanlen this offseason to try and improve his offensive game but it never came to fruition. He averaged more points this season (6.3) but that was due to his increased usage and shot volume. In what looked like it would be another ho-hum season with just minor improvements, Oubre turned in the best stretch of his career starting with a 16 point and 7 rebound game as the Wizards beat the Cavs, 127-115 on March 25th. That kicked off a stretch where Oubre would average 11.4 points per game over the next 10 games, the best stretch of his career. Unfortunately, that hot stretch didn’t fully carry over to the playoffs as Oubre’s numbers reverted back to the mean as he averaged 5.8 points and 2.3 rebounds; very similar to his shaky and inconsistent regular season numbers. Now, Oubre enters a very pivotal offseason. Unlike Porter, he will not be forced into a starting role in his third season. That means Oubre will need to continue to make strides in his game keeping in mind that his minutes will probably hover around the 20-minute mark again next season. In a recent interview, Oubre stated that he’ll be working out with Bradley Beal this summer to work on creating his own shot and setting up others. This seems like a big mistake. Oubre still has not become a knockdown shooter or a lockdown defender. To flourish as a key bench player next season, he’ll have to raise his three-point shooting percentage. His jump shot did look much cleaner this season than when he entered the NBA but the only issue was, it still never went in at a high rate. Shooting 28.7 percent from distance isn’t going to cut it. Like his rookie campaign, Oubre would either shoot a three-point shot or would try to drive all the way to the hole and finish in traffic. There was an improvement here as Oubre connected on 57 percent of his field goals within eight feet from the hoop, but keep in mind that includes plenty of easy, uncontested dunks off of turnovers. When he tried finishing over seven-footers in halfcourt situations, it often led to poor shot attempts or turnovers before he even got a chance to get a shot up. In addition, Oubre should focus on improving his perimeter defense. Wizards fans salivate over Oubre’s physical tools as he stands at 6’7 with a 7’1 wingspan, but he hasn’t become a great on-ball defender, yet. He still gambles too often on defense, is overzealous, and commits far too many fouls. As Oubre enters one of the most important offseasons of his career, he’ll be best suited in trying to hone in his shooting and defense rather than worrying about creating his own shot. Because when it boils down to it, his evolution and ceiling as an NBA player most likely mimics that of Trevor Ariza and Otto Porter more than it does Paul George or Kawhi Leonard. Wizards have no answer for Leonard, Lose to Spurs 114-95. Kawhi Leonard led the way for the Spurs scoring 27 points as they beat the helpless Wizards, 114-95 tonight. John Wall and Marcin Gortat were the high scorers for the Wizards scoring 20 points apiece while Kelly Oubre Jr. scored a career-high 18 points tonight. The Wizards shot an impressive 60 percent from the field in the first quarter and led 31-26. That optimistic start quickly faded as the Spurs deep bench exploited the Wizards banged up bench. Randy Wittman decided to shake things up starting Kris Humphries and Gary Neal in favor of Jared Dudley and Garrett Temple. It didn’t matter as Neal got in foul trouble early and was forced to the bench. The Spurs led 55-52 at halftime and hope was still in the air. As the Spurs do most teams, they methodically pulled away from the Wizards. The three-pointers that weren’t falling in the first half started dropping in the third quarter for the Spurs. They didn’t do anything fancy or flashy, they just executed their plays and swung the ball from side to side whereas the Wizards didn’t do either. The Wizards went cold only scoring 19 points in the third period. Manu Ginobili hit a transition three pointer with .5 seconds remaining left in the third quarter. That stretched the lead out to 15, 86-71 as the Spurs would coast through the fourth quarter to a 114-95 victory. The Wizards played well… for a half: The Spurs gave up a season-high 31 points to the Wizards in the first quarter who shot 60 percent from the field. The Wizards scored 28 points in the paint first half coming off of John Wall drives, backdoor cuts from Oubre, and Wall and Gortat running the pick and roll to perfection. The second half? No so much. The Wizards scored just 43 points in the second half as the Spurs pulled away. The pick and roll game was no longer working and John Wall was unable to get out in transition. The law of averages came into play as the Wizards shot 41 percent from the field for the game after knocking down 60 percent of their shots in the first quarter. Kawhi Leonard is the latest wing player to go off against the Wizards: LeBron James, Paul George, Carmelo Anthony; now you can add Kawhi Leonard to the list of wings to go off against the Wizards this year. Leonard scored 27 points on 9-15 shooting including 4-7 from three-point range. In addition, he locked down Otto Porter on the defensive end who was essentially invisible tonight. Aside from Kelly Oubre, the Wizards didn’t get much from the bench: Oubre scored a career high 18 points highlighted by this dunk midway through the fourth quarter. Oubre showed flashes of why the Wizards drafted him. The rookie hit a three in transition, showed his ability as a finisher when slashing to the hole, and went 4-4 from the free throw line. Is he going to snag a starting spot anytime soon? Probably not. But his minutes are only going to increase with nights like tonight. With just seconds left in the game, John Wall found Bradley Beal curling off a screen; Beal shook LaMarcus Aldridge to get open and knock down a three pointer –DAGGGGGGGEEEEERRRRR with just .3 seconds as the Wizards win 102-99. Beal led the way for the Wizards with 25 points followed by Otto Porter with 19, and John Wall who chipped in with 17 points and 13 assists. Everything was all good as the Wizards stormed out to an early 19-2 lead. But as you’d expect from a Gregg Popovich coached team, the Spurs did not panic and answered with a 21-3 run of their own to end the quarter as the Wizards’ shooting went ice cold. Otto Porter was able to stop the cold spell scoring on back-to-back possessions as the swingman started 4-5 from the field. Kawhi Leonard gave the Wizards fits all night and went on a personal 6-0 run as the Spurs stretched their lead to 12, 51-39 late in the second quarter. The Wizards countered with an 8-0 run of their own punctuated by a nice floater from Beal in the lane. The Wizards kept hanging around and were able to cut the lead down to 4, 51-47 at halftime. The Spurs started hot to start the second half and once again, it was Porter who ended the Wizards’ cold streak with a nice jump shot. Gortat was struggling for most of the game and the Wizards ran a few plays for him at the start of the third quarter to get him going. Gortat was unable to capitalize and it looks like this change in philosophy could already be plaguing the big man. The Spurs held a steady 6-8 point lead through the third quarter and were up 73-66 after three. Not a ton of defense was played to start the money quarter as the teams began trading baskets. Porter found Wall who raced out in transition for a layup and the foul; cutting the Spurs lead to three. Bradley Beal would find a streaking Gortat for a thunderous dunk and then had a nice transition dunk of his own as the Wizards regained the lead 92-90 late in the quarter. With the Wizards up three and under 30 seconds to play, the Spurs tried to get Danny Green open for a three. Otto Porter did a great job not letting Green shake loose but Green found Tony Parker who hit a three with 7 seconds to tie the game at 99. The Wizards had the last shot and John Wall would find a curling Bradley Beal who knocked down the game-winning three pointer with just .3 seconds remaining as the Wizards win 102-99. 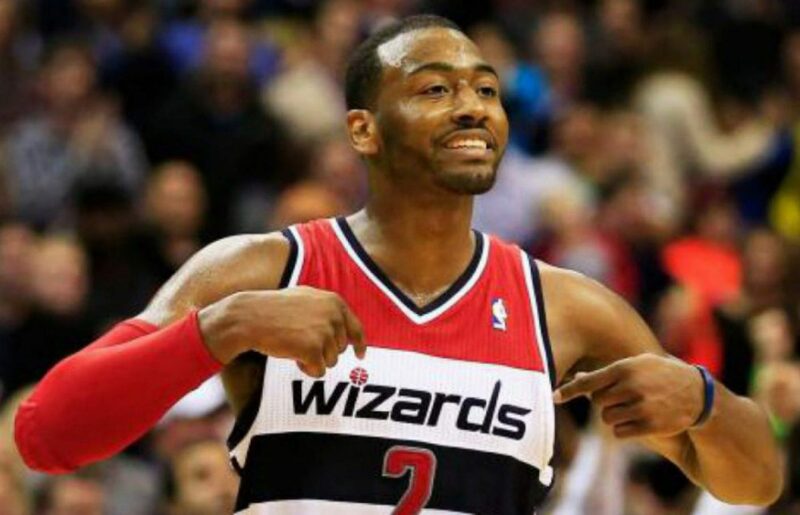 Wizards front office: give the man his max deal.